Elite 5220 Double Arm Pole Mount | ICWUSA.com Inc. The Elite 5220 pole mount lets you easily move your computer wherever it’s needed. A true sit-stand workstation, this arm provides up to 42″ (106.7 cm) of vertical adjustment, enabling staff members of different heights to work in comfort. For example, it can easily and quickly adjust for either a 5’ person or a 6’6” person. Sit-stand workstations enhance employee health, reduce fatigue and eliminate “sitting disease.” This arm swivels 360° at the mount and reaches up to 68″ (173 cm). The Elite 5220 pole mount for computers and monitors is popular in dental and healthcare settings. The Elite 5220 Double Arm Pole Mount provides finger-light movement, optimum viewing angles and unsurpassed reach, making it ideal for dental, healthcare and manufacturing/industrial environments. The arm is simple to adjust and effortless to use so personnel can focus on the task at hand. The monitor tilts, swivels and rotates, reducing screen glare and easing neck, back and eye strain. 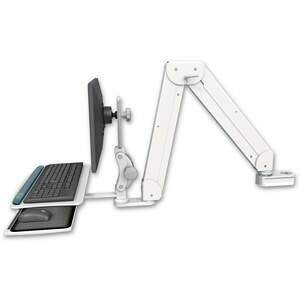 The Elite 5220 arm is available as a wall mount, wall track mount, pole mount or desk mount. It can be configured with a monitor only or with a monitor and keyboard tray. The Elite 5220 computer mounting arm stows compactly, yet reaches well into the room. The arm mounts to a pole and has a stowed depth of 11″ (28 cm). Its horizontal reach is 53″ (135 cm) with monitor only, and 68″ (173 cm) with monitor and keyboard tray. The Elite 5220 mounting arm supports the monitor with a Paralink adjuster which enables the monitor to move 6″ (15.2 cm) vertically on sliding rails. The Paralink also provides 5″ (12.7 cm) of parallel forward monitor adjustment and 360° of screen swivel. ICW’s ball VESA attachment enables 6-way tilt, pan and rotation of the monitor. The Elite 5220 arm is counter-balanced, making it effortless to move in any direction. Internal cable management creates a neater appearance, protects wires and simplifies cleaning. Adjustable rotation stops protect the equipment and facility from damage. Machined from aircraft quality aluminum, the unit has an attractive, durable finish. ICW computer mounts are designed, engineered, manufactured, and hand-assembled with complete attention to detail. The Elite 5220 arm will provide years of dependable service. The Elite 5220 Arm enables a monitor and keyboard to be suspended from a pole, pulled out when required, and stowed out of the way when not in use. The Elite 5220 Arm is machined out of aircraft quality aluminum for strength and durability. Available in 5 standard and 9 custom powder coated finishes to match your décor. Engineered, manufactured, and hand-assembled in the U.S.A. ensures unsurpassed quality, workmanship and dependability. Monitor rotates to portrait position to eliminate scrolling. With a monitor only, the arm reaches 53″ (135 cm) horizontally. With the keyboard tray, the arm reaches 68″ (173 cm) horizontally. The arm with monitor and keyboard tray has a stowed depth of 11″ (28 cm). The arm rotates 360° at the pole mount for unsurpassed reach in all directions.